Vida Condominium (website) has just released a rendering of the proposed project which will include 238 flats and loft homes. Vida is anticipating holding design preview events in early 2008 where buyers will have their first opportunity to view initial floor plans, interior finishes as well as architectural and landscaping design inspirations. 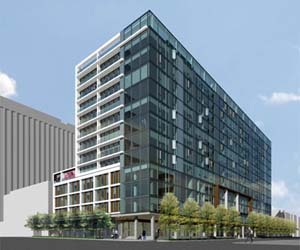 The developer is currently in the permitting stage and is expecting to begin construction in 2008. For additional information about this project, please see our previous Vida Condo post.